Although Connecticut has generally been very good at keeping slip-ups from escaping, sometimes there are test plates and errors which make it out. While I don’t have examples of many of the common errors, here is a sampling of some goofs. The ‘M’ is an upside-down ‘W’. “Heavy Dot” error- the dot sank to the bottom. A number of plates in this series had the dot in this position. 1980s inverted-letter vanity. I guess they used both of their ‘M’s in the first half of the plate, because they used inverted ‘W’s for the second half. A similar error can be found on the map base plates in the ‘-JWW’ series – the second ‘W’ is actually an upside-down ‘M’. The EBL and EBM series (possibly more) were missing the dot. An EBM series no-dot plate. It wasn’t long before the dot disappeared again in the FOG series. It was missing for the FOH series as well. … or even the FOO. Thankfully it reappeared after the FOV series, otherwise who knows how many of these no-dot plates I would have picked up along the way. 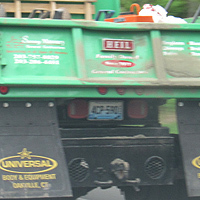 Although you can’t tell from the picture here, this is an error plate – it’s not reflectorized. It’s not that the glass beads on the numbers washed off, they were never applied. 1988 plate with “half-invert” decal. There are a few of these decals out there. 7-digit plates were only recently approved in Connecticut (on the light blue base). ca. 1990s error. This can’t be a vanity, because you can’t go back-and-forth with letters and numbers. Perhaps this was supposed to be a remake of “929-BKZ“? This invert is different from most in that each individual letter was inserted upside-down, as opposed to the usual entire number being inverted and backwards. I.e., this plate number was 821-JWZ, whereas if this were a typical invert the number would be ZWJ-128. This plate was donated by the Connecticut DMV to the ALPCA convention auction a few years back. ca. 1990s error. It appears that most, if not all, of this series was stamped with the letters and numbers backwards then caught before they were painted. A motorcycle plate in the same style. I’m not sure what the issue was with this plate; it looks like it would be a re-made number from the early 1970s made during the early 1980s. A short illustraton of how plates are made: The reflective sheeting is applied to the aluminum plate and the holes and rounded corners are punched. Next the numbers/letters and border are embossed into the plate. Then the raised areas are painted. In this case, the wrong color: Red letters are for Commercial/Trailer/Farm etc. plates, not passenger like this one. 2007 Special Equipment Dealer error – the legend should be “Dealer” instead of “Repair”. 1976 Parkway Toll plate with an inverted “W” for the “M”. Seems to be a common error.